Kohaku koi fish is a Japanese species which is known for their white and red coloring. They may be scale less or scaled, and some patterns such as Tancho, where the fish’s body is white with a red spot on the head, is highly valued. These fish are bred in Japan andcompetitions are held where owners show off their fish, with the best being given awards. The many types of koi that exist today are said to be derived from the Asagi, which is the original fish that all koi descend from. Asagi are large fish with red, blue and white marks. Kohaku are fish with white skin and this is significant since white skinned fish are incredibly rare in nature. In the animal kingdom fish that have white skin are vulnerable because they are easily recognized and consumed by predators. While albino fish do occur naturally this is considered to be a defect. Breeding a fish with white skin was a process that took the Japanese many years of trial and error. The Kohaku is one of the oldest koi varieties, and is itself split into groupings, which are Nidan, Tancho, Ohmoyo, Yondan and Sandan. These names are associated with steps and the steps correspond with the amount of red patches that are present on the fish. Kohaku which display three different red marks would be designated a three step Kohaku. These fish are appreciated by both enthusiasts and amateurs alike due to their size and beauty. There are a number of features which are sought after in Kohaku koi. The white skin must be pure, with no presence of yellow or pink coloring whatsoever. Reddish coloring that appears on the skin of the fish must be sufficiently thick that the scales are hidden. At the same time, the colors which a Kohaku displays on its scales should not bleed into one another, especially into the white scales. Frecking and spots are undesirable, as is red coloring on the fish’s fins. The scales themselves should be distributed evenly over the body of the fish, and the patterns must start at the head and be prominent and balanced. The fish should be shaped like a torpedo with body parts that are well proportioned. One benefit of owning Kohaku is that they don’t have any special maintenance needs. 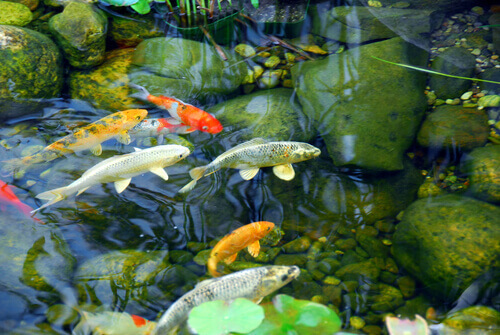 The standard fish care which is used for koi will also suffice for Kohaku. These fish tolerate cold weather well and as such can be kept outside all throughout the year. The popularity of koi both within and outside Japan has made it a species which appears in ponds all over the world. Those looking for high end Kohaku will have to acquire them through specialty breeders, and the price tag for these fish will be a hefty one. The top breeders will typically have a record of certifications involving the bloodline of the fish to verify their quality and lineage.